Those of you who, like me, miss Grand Canyon’s superb burgers are in for a treat. 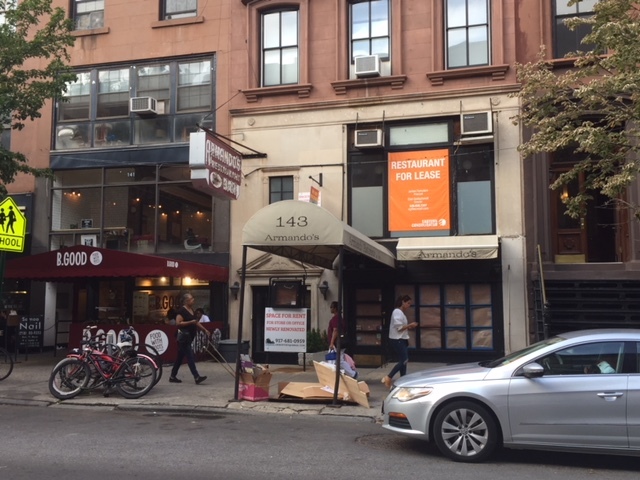 While the “Restaurant For Lease” sign remains above the former Armando’s site at 143 Montague (see photo by your correspondent taken this evening), the Commercial Observer reports that the restaurant’s owner, who kept open another Grand Canyon in Park Slope, has taken that space and will return to Montague. It will be right next door to Grand Canyon’s old location, now occupied by B.Good. The one downside to this, although it was probably foreordained by Armando’s closing, is that we will lose the Armando’s sign with its iconic lobster, much loved by many, especially our beloved founder, John “Homer Fink” Loscalzo.